he legendary facial hair championship celebrated in story and song is returning. 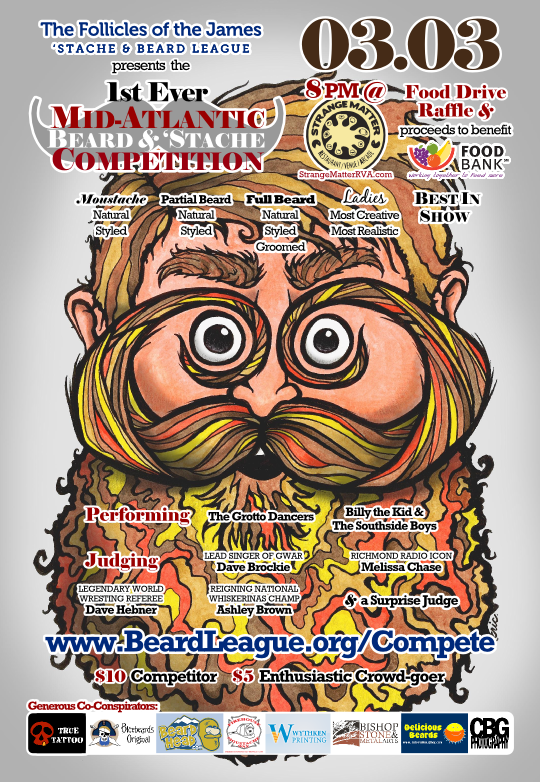 The mighty RVA Beard League invites you to join us the 22nd day of April at the battlements of the Canal Club in Richmond for the Mid-Atlantic Beard & ‘Stache Championships VI, Presented by Legendary Beard Company, where 100% of the proceeds will benefit the Pink Ink Fund! Tickets are $15 in advance and $20 at the door, with no extra fee to compete in any of our 15 categories. Doors open & on-site registration starts at 4 PM, and the Championships starts at 6 PM! Frequent updates for the event will be made on the Mid-Atlantic Championships' Facebook Event page. Be sure to click that you’re Going, then share it and tell your friends! We have four main events planned throughout the weekend for local folks and those traveling from out-of-town to enjoy. With the obvious exception of the Championships (at $15/$20), all are free to attend. We're working on a few side events throughout the month to get things going early! Charity Beers & Bake Sale ...get baked (goods) on 4/20! Thursday, April 20 from 4:00 p.m. to 9:00 p.m.
Friday, April 21 at 9:00 p.m.
Doors/Registration starts at 4:00 p.m.
Sunday, April 23 at 11:00 a.m. Pink Ink Fund is a 501(c)3 Non Profit Organization here in Richmond that seeks to aid people needing assistance with their post-mastectomy tattoo needs as part of their Breast Reconstruction due to Breast Cancer and/or BRCA diagnosis. They assist patients with reconstructive, restorative, and recovery tattooing, providing an important part of their full physical and emotional recovery. Take a look at some of the work the Pink Ink Fund does on their Instagram or Facebook pages to see why we're supporting what they do.